Who’d have thought that we’d celebrate two BT projects in a week? But this one is really cute. 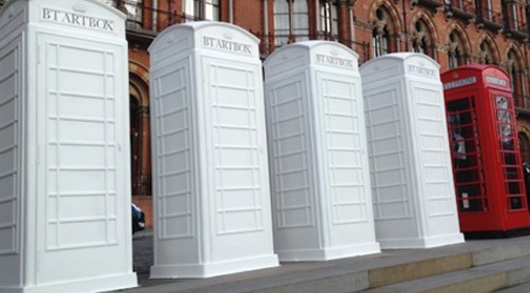 BT Artbox celebrates 25 years of ChildLine by asking artists including Keith Tyson, Romero Britto, Giles Deacon, Zandra Rhodes and a host of others to decorate a fibreglass replica of Gilbert-Scott’s original phonebox. The boxes will be “exhibited” across London before a gala auction is held at the National Portrait Galler where they will all be auctioned off for charity. Apart from this being a cracking little stunt, I was just dead chuffed to see BT exploiting its heritage and history in a really positive, bang-up-to-date and, above all, socially aware, way. Normally with BT (in my experience), they are a bit wary of being a legacy telecoms provider and therefore almost over-cautious about using their past to celebrate their present – or indeed the future. This struck me as a great example of jettisoning that attitude and making a heritage icon into a great piece of contemporary PR. It’ll be interesting to do what they do with the whole thing once it hits the streets. There are a bunch of things that I’d love to see them do with this platform – be fun to watch whether they get the full mileage out of the great new property they’ve created.